Enjoy the feeling of cruising the open road with your favorite tunes! We all love listening to our favorite music when we’re out on the open road, blasting the radio. Not a care in the world. Now you can enjoy that feeling anytime, anywhere. The Mustang Stereo has great styling that evokes the look and feel of the classic mid-60’s Ford Mustang—the perfect open-road cruising machine. This is a portable speaker with a sensitive AM/FM radio, and it also wirelessly streams music from any Bluetooth®-enabled device. Your man cave never sounded so good! The tuning dial looks just like the speedometer of the classic mid-60’s Ford Mustang, right down to being flanked by round dials on either side. It’s got a great sound system with two full-range speakers and a rear-firing bass radiator for exciting, booming sound from a small package. The tunes keep playing all day long, thanks to the long-lasting rechargeable battery. No pit stops needed! 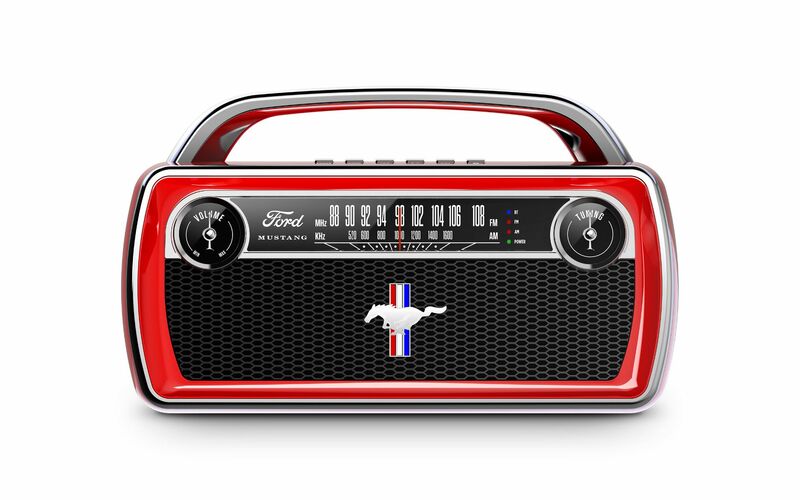 Whether you’re working in the garage, having fun in your dorm or on the go, the Mustang Stereo handles every curve.